Raised beds have been around for years, but have become increasingly popular recently because they make the landscape orderly, organized and easy to maintain. You can readily reach over and pull weeds as they appear, plant more comfortably and enjoy the new tiered depth and dimension of your lawn and garden. Raised beds are also particularly helpful if you are working with heavy soils that drain poorly, or if you have mobility limits that make getting down to ground level more difficult. Define the bed lines with a rope or hose. Consider the overall bed size, as well as the size and shape of your building material. You may want to position the bed along a fence or in a corner for more dimension and support. Dig a 4-6” deep edge along the perimeter. Don’t worry if this line isn’t as neat as you would like, because it will be more refined once you construct the bed frame. Remove existing sod/grass from the bed. You can compost the removed material, or use it to patch other spots in your lawn or turf as needed. Place concrete blocks, wall stone or other edging along this new bed line to build your bed frame. Wooden railroad ties or planks can also be used, but be aware that they may warp or decay in time. In general, stone or other sturdy materials are preferred. Build up your flower bed approximately 6-8” with top soil, mixing in peat moss for better drainage and compost, leaf mulch, cow manure or similar organic material to adequately nourish the soil. Compact your soil mixture as you build up each layer. This will help keep the bed from settling excessively as you plant and water. Increase the visual impact of your flower bed or gardening area by planting at different levels. Arrange shorter, lower growing plants in front, followed by medium and then tall plants in the back. You might consider some “spiller” plants along the sides and front if desired. Choose plants carefully to match the size of the bed, avoiding plants that will quickly outgrow the smaller, more confined space. 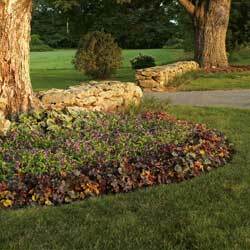 Apply a 2-3” layer of mulch or stone and thoroughly soak your new landscape feature. Sprinkle Miracle Gro Weed Preventer or a similar product over the area to provide an invisible layer of protection against germinating weeds. Before you know it, your new raised bed will be thriving and will quickly become the centerpiece of your landscaping. Then it’s time to construct another!